1:00:26: Visual: Footage of city and state leaders including Michael Dukakis (Governor of Massachusetts), Charles Stith (Union United Methodist Church), Bernard Cardinal Law (Archidiocese of Boston), and Ray Flynn (Mayor of Boston) singing together at celebration in honor of the birthday of Martin Luther King, Jr. (civil rights leader). Meg Vaillancourt reports that local leaders gathered over breakfast today to celebrate Martin Luther King's birthday. Vaillancourt notes that there was controversy at the breakfast over a new assignment plan for students in Boston Public Schools. V: Footage of Juanita Wade (Boston School Committee) speaking to the media. School Committee members John O'Bryant and Jean McGuire sit beside Wade. Wade calls the new plan "segregation redux." Wade says that the Boston Public Schools need to provide choice, equity, and a quality education right now. Footage of Flynn speaking to the media. Flynn says that the plan has the support of the citizens of Boston; that parents are looking for this kind of reform. Vaillancourt reports that the new plan would allow parents to choose which schools their children will attend; that parents have not been able to choose schools since school desegregation began in 1974. V: Shots of buses pulling up to the front of South Boston High School in 1974; of South Boston residents jeering at the buses. 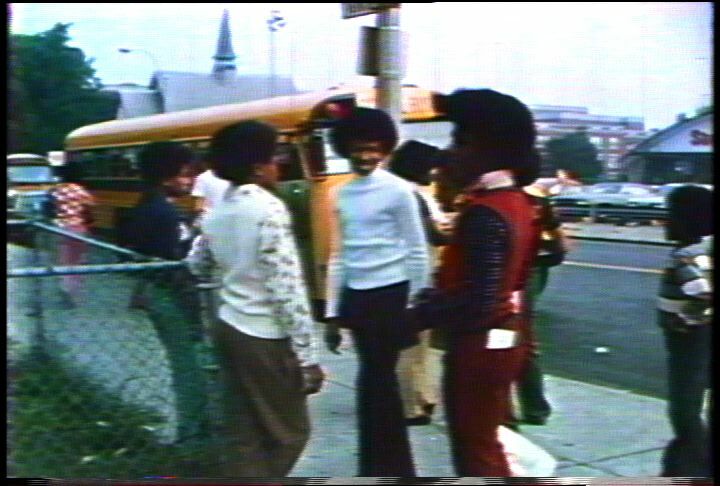 Shots of buses parked in front of South Boston High School; of African American students walking among the buses. Vaillancourt notes that the population of white students in Boston Public Schools has declined since 1974; that non-white students make up 70% of the student population in Boston Public Schools. Vaillancourt adds that the School System has been criticized for not providing students with a quality education. V: Shots of non-white students in a classroom; of an African American male student sitting in a classroom. Shot of Flynn. Vaillancourt reports that Flynn and two consultants have proposed a plan to improve the schools and to increase parental choice. V: Footage of School Committee members O'Bryant, Wade, McGuire, and Gerald Anderson sitting on a couch. 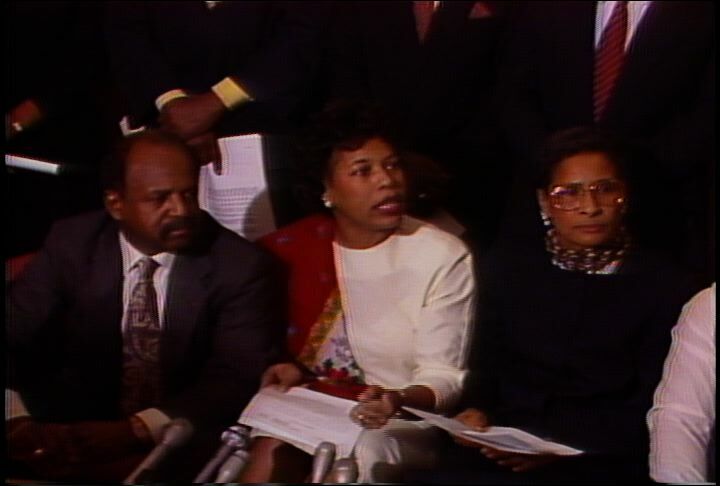 African American community leaders, including Charles Yancey (Boston City Council), Eugene Rivers (African Peoples Pentecostal Church) and Louis Elisa (Boston chapter of the NAACP), stand behind them. Anderson addresses the media. Anderson says that the Boston School System needs to provide a quality education to all before it can claim to be equitable. Anderson says that the mayor needs to provide more funding to the schools. Shots of O'Bryant and other community leaders. Footage of Flynn being interviewed by Vaillancourt. Vaillancourt asks Flynn if he is surprised by the attitude of the African American community leaders. Flynn says that he has been working on the proposal for several months; that community leaders have had many opportunities to review and give input on the proposal. Footage of Anderson saying that he is offended by Flynn's attitude. Anderson notes that Flynn has said that the statements of the African American leaders are "bogus." Anderson says that the community leaders are standing up for their constituents; that Flynn's statements are "bogus." Footage of Flynn saying that the members of the School Committee have had input on the proposal; that the members of the School Committee voted twelve-to-one in favor of the plan. Flynn says that the School Committee members were told that they would have further opportunities to give input on the proposal. Footage of McGuire saying that Flynn's proposal will cost more money. McGuire says that the School Committee has not been given additional money to fund Flynn's proposal. Vaillancourt reports that the Boston Public School System spends more money per student than any other public school system in the nation. V: Shot of an African American teacher and student at the front of a classroom; of a white male student seated in a classroom; of an African American female student seated in a classroom. Vaillancourt notes that Flynn has come up with another controversial proposal to fund neighborhood schools; that Flynn has suggested the decentralization of the Boston School Department. Vaillancourt adds that the proposal would sell off the downtown headquarters of the Boston School Department on Court Street. V: Shots of the exterior of the Boston School Department headquarters. 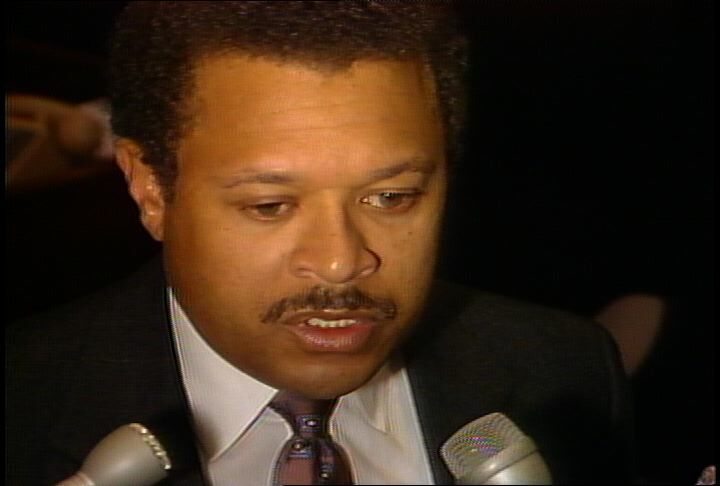 Footage of Flynn saying that the downtown headquarters of the School Department should be sold; that the money should be put into neighborhood schools. Footage of O'Bryant saying that the School System is going to end up back in court if it does not receive support from the city. Vaillancourt reports that Dr. Laval Wilson (Superintendent, Boston Public Schools) has supported Flynn's school choice plan; that Wilson's contract ends in June. V: Shots of a meeting in the chambers of the Boston School Committee; of Wilson speaking at a School Committee meeting. Vaillancourt reports that the African American members have voted to extend Wilson's contract in the past. Vaillancourt notes that Wilson's future support among the Committee's African American members may depend on his position on Flynn's school choice plan.